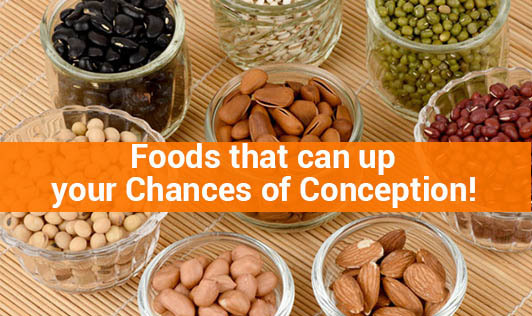 Foods that can up your Chances of Conception! • Milk: Milk, a rich source of calcium, is not just great for your bones, but also for your reproductive health. Whole milk especially can help you overcome ovulation issues and get you pregnant. But if you are overweight, watch your intake of whole dairy products. Replace it with low fat yogurt or green leafy vegetables. • Lean meats: Lean meat is a good source of iron which is important for conception. Studies suggest that women who consume good iron in their diet are more fertile than ladies who lack it. Do not overdo your intake of meat as they are high in protein, and too much protein can decrease your fertility. Vegans can replace it with beans. • Whole grains: Rich in complex carbs, whole grains are nutritious. They are rich in folic acid, important for conception. Whereas, refined carbs like white breads or white pastas can spike your sugar levels, messing up with your ovulation hormones. Whole grains also keep the menstrual hormones stable and may even promote regular ovulation. • Salmon: Along with salmon, Sardines and Herring are fertility boosting foods as they are rich in omega-3-fatty acids. They regulate reproductive hormones, increase blood flow to the reproductive organs and even minimize stress. Vegans can look for walnuts or flaxseeds or instead, ask your Doctor for the supplements. • Yam: Do not worry about the starch in yam but go for it while planning for conception. It is known to stimulate ovulation and improve your fertility. • Berries: Blueberries, raspberries, gooseberries etc are wonder foods for conception. Full of antioxidants, berries protect your eggs from damage and ageing. Share them even with your partner, as they can keep his sperms strong and healthy! • Oysters: All you sea food lovers can munch on oysters as they are excellent in zinc. Zinc deficiency can slow down ovulation and also disrupt your monthly cycles. Can't take oysters? How about lean meat, dairy products, whole grains, nuts, eggs and legumes? Say NO to swordfish, king fish, mackerel, tilefish, tuna, and shark as they are rich in mercury that is linked to infertility. Avoid trans-fats or hydrogenated oils and even deep fried foods or foods with hidden trans-fats. Carefully look for hidden trans-fats and remember to read the nutrition label carefully.